It’s snowing…ground cinnamon! Ok, it’s not, but in chai vanilla tart land it is. Tufts announced yet another snow day on Tuesday. I have been loving these snow days, but I wish we could order them a la carte. They sort of come in a package deal. The only hindrance is things pile up at work faster than the snow does on the roads. So what does this gal do when she gets a snow day? She walks to the closest grocery store, regrets it immediately, then buys ingredients to make a delicious Chai vanilla custard tart. 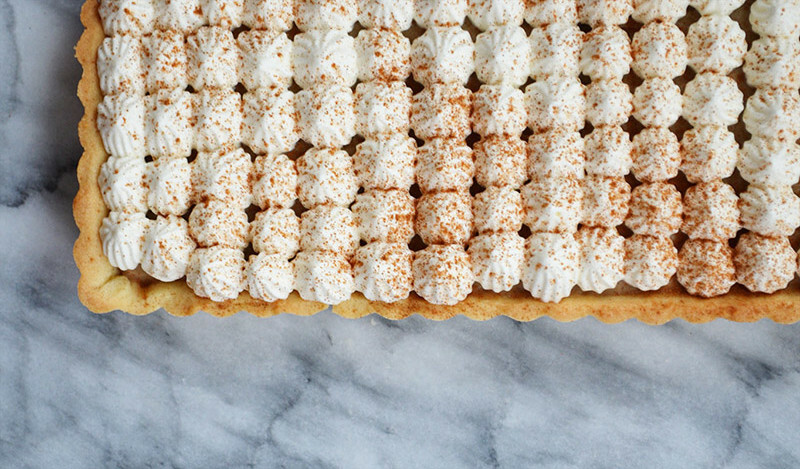 Getting cozy in bed while sipping on a warm cup of tea and indulging in a piece of this tart is all I want to do when it’s snowing outside. Cinnamon, a very warm spice, is essential in Masala Chai. It’s the perfect spice to contrast the weather outside. 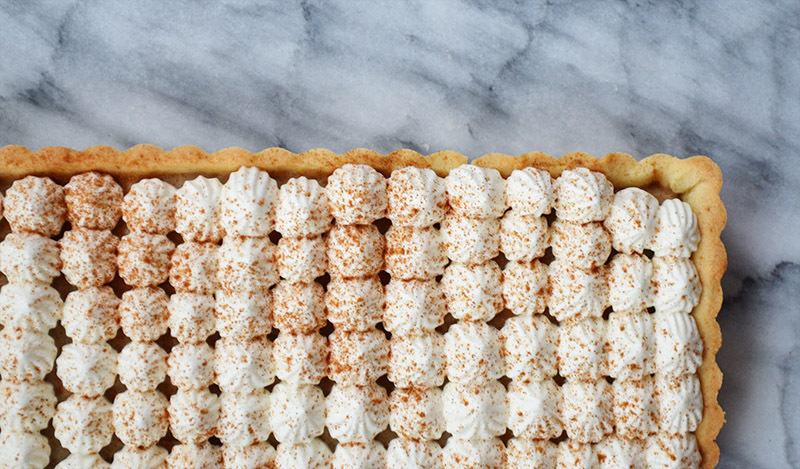 So now you know why I braved the outdoors to get ingredients to make this tart. The custard is smooth and just lightly spiced. The infusion of the tea bags adds the delicate flavor of Masala Chai, which is neither over- nor under- whelming. The intoxicating fragrance filled my apartment up with a sweet and spicy smell that I wish would last forever. 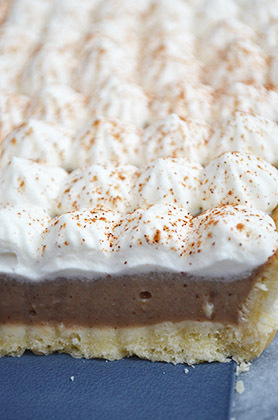 The recipe is adapted from Pies and Tarts, a cookbook by The Culinary Institute of America. I received it as a Christmas gift from Papa U, and I absolutely love it. In a large bowl, combine the butter and sugar, then mix on medium speed until smooth, about 4 to 5 minutes. Stop once or twice to scrape down the sides of the bowl. Add the egg and vanilla, and mix on medium speed until well combined, about 3 to 4 minutes. Reduce the speed to low, then add the flour, cornstarch, and salt. Mix until just combined, and do not overmix. Turn the dough out onto a lightly floured surface. Shape the dough into a 5-inch disc, then wrap it tightly in plastic wrap. Refrigerate for at least 1 hour, preferably overnight, until firm. Preheat the oven to 400F degrees. On a lightly floured surface, roll out the dough into the shape of the tart pan you're using, making it slightly larger than the pan. Transfer the dough into your tart pan, fit into the pan, and trim the edges. Line the crust with lightly oiled parchment paper, then fill the pan with dried beans (this will act as a weight). Bake for 15 to 20 minutes, until the crust is slightly golden. Take the crust out of the oven, and lower the baking temperature to 350F degrees. Remove the beans and parchment paper, then bake for another 8 to 10 minutes, until it's lightly browned. Remove from the oven, and place the crust on a wired rack to cool. In a medium bowl, whisk together the ¼ cup milk, egg, and egg yolks. Slowly mix in the ¼ cup brown sugar and cornstarch, and whisk until its free from lumps. In a medium saucepan, heat up the remaining milk and remaining brown sugar over medium heat, and stir to dissolve the sugar. Stir in the cinnamon, ginger, and allspice. Bring to a boil, then remove from the heat and add the tea bags. Steep for 5 minutes, then discard the tea bags. Slowly add ⅓ of the hot milk mixture to the egg mixture, whisking quickly to temper the eggs. Return the tempered egg mixture to the remaining milk mixture in the saucepan and cook, stirring continuously until it reaches a boil. Cook for an additional 2 minutes. Remove from the heat, then stir in the butter. Pour the custard filling into the prepared crust, then smooth and level with a butter knife or an offset spatula. Place plastic wrap directly on the surface of the custard to prevent a skin from forming. Allow it to cool at room temperature for 1 hour, then refrigerate for 1-2 hours. In a medium size bowl, beat the cream on medium-high speed. Slowly add the sugar and the vanilla extract. Continue to beat the cream, until smooth and thick, about 3 minutes. Once stiff peaks develop, it's done. Do not over mix! Pipe or spread over the chilled tart. Lightly sprinkle ground cinnamon over the tart (optional). I used a 4½ x 14 inch tart pan, but alternatively, you can use a round 9 inch tart pan. This entry was posted in Desserts & Sweets and tagged Chai, cinnamon, custard, tart, tea, vanilla, whipped cream. This tart is so pretty! I love chai custard, totally worth braving the snow for! Thanks, Kelly! I’m so glad you’re with me on this. 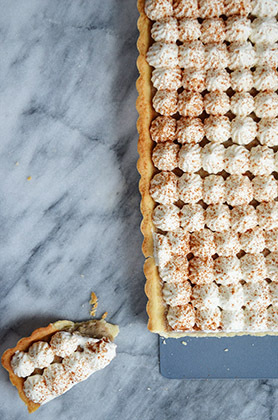 Oooh I love this, such a gorgeous tart and the flavors sound amazing. I adore chai tea and that custard sounds delicious. This is one stunning tart! I love the chai flavors! Pinning! MMM this cake looks delicious! 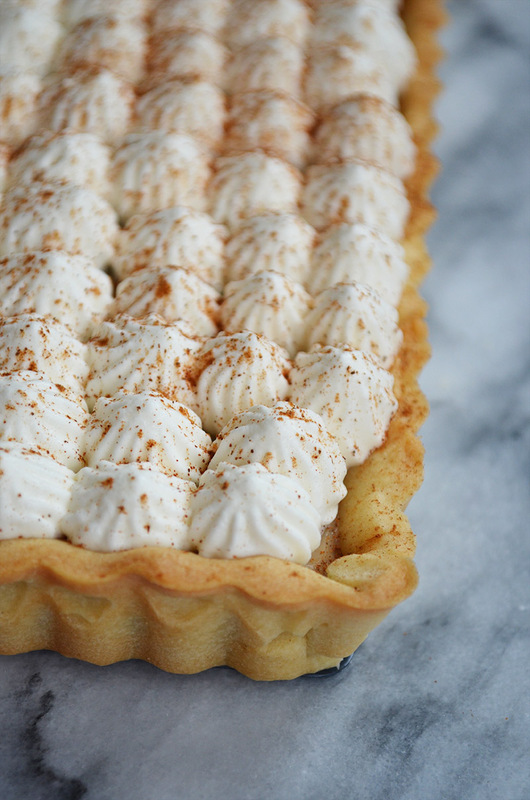 I love chai tea latte so can imagine this tart must be full of amazing cinnamon-y flavors and the lovely chai tea smell. 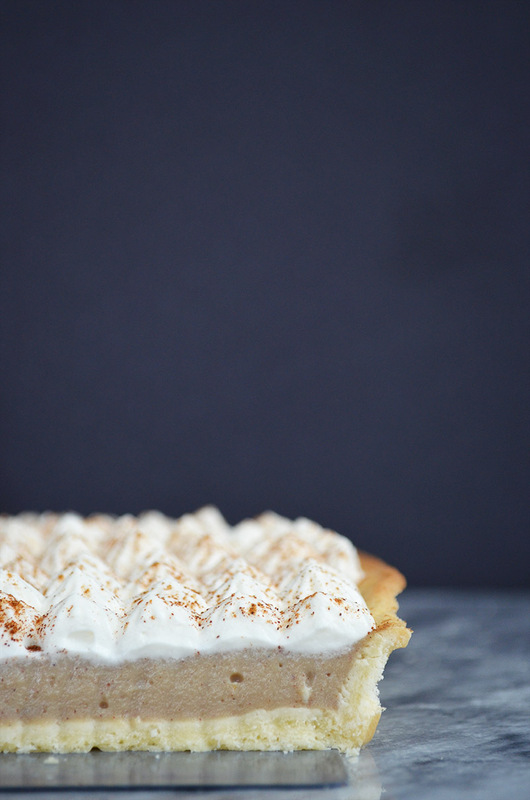 Also this pie makes snow days sound like they can be little blessings in disguise! My cake / pie / tart differentiation is embarrassingly sad. I call them interchangeably kind of regularly. ok very regularly. <—- need to improve on this. Thanks, Sarah!! They’re all so delicious, so I totally understand why you’d use them interchangeably!! (: We’re getting another blizzard this weekend, which means more baking!! Oh my. This is STUNNING! Check out that perfect topping! Check out the perfect layers!! Thanks, Nagi!! You are too sweet! This is stunning Connie!! send me some over please! I just made these and they are amazing! What a beautiful recipe, I can’t wait to try the lavender tarts!